Martin had been thinking about becoming an entrepreneur for his whole life because he could not imagine being satisfied with becoming “the employee of the month”. However, he had never tried to become self-employed because he feared that he lacked the practical skills. He explained that he had some knowledge in entrepreneurship but did not know how to put it into practice and, hence, never started a business. Asked about the most important learning experiences, Martin said that the training taught him how to plan and execute the start-up of a business, how to develop financial plans, and how to manage finances. After the training, Martin started a restaurant in a town near the capital of Uganda, recognizing a lack of restaurants in the local market. Martin identified the business idea of a restaurant during the STEP training, in which he sold fresh juice together with the other members of the start-up team. He opened the restaurant about eight months after the training. When we met him 18 months after the training, he managed his restaurant successfully and made about 380 USD sales per month. He employed five persons, two full-time employees, and three part-time employees. In addition to the restaurant, Martin started a boutique that sold clothes and shoes for women and children 15 months after the training. The business was located in his parents’ home village some hours away from Kampala. Martin also identified the opportunity to start a company supplying construction materials but because of the high capital requirements, he was not yet able to start operations. Martin mentioned that despite the high amount of starting capital, he would not give up on that business opportunity. After some time Martin faced sudden setbacks and difficult challenges. Four years after the training, he mentioned that he had also opened up a small hotel. His workload from managing several businesses at the same time had been very high. Furthermore, the hotel incurred losses and Martin lost a high amount of money. Despite the fact that he had diligently planned the different steps to start and run the businesses, he had to close the hotel. He explained that the training was a crucial factor in deciding to continue with entrepreneurship because STEP gave him the determination and courage to do so. After the training, his most important principle became “never give up”. This determination and persistence resulted in new businesses and in employment opportunities that he created for himself and other people. Martin had to close one business but was able to continue running his other businesses. He wanted to use the profits to create new businesses that start small and grow over time. Martin persisted in his entrepreneurial ventures and became a successful serial entrepreneur. Due to the huge international influence on Tanzanian fashion market Msafiri felt as a part of Tanzanian culture was lost. He wanted to do his part in preserving his culture – and his business idea was born. Msafiri Raphael attended a Bachelor of Commerce in Finance at Dar es Salaam Business School and graduated in 2016. The first time he appeared in our office, he had his iPad and smartphone in his hands, wearing a sort of traditional African material but still fashioned t-shirt, and seemed to be busy and distracted. However, when we started our conversation it became clear that his general appearance was a clever move to guide our views towards his clothing. He was challenging our intuitive thinking by appearing like a busy sales-person but wearing traditional fabric clothes. During our conversation Msafiri explained that he started a small tailor’s shop in Dar es Salaam market district Mwenge after he graduated. Throughout his studies he dreamed of working in a big international corporation leaving his home town or even Tanzania. However, as he graduated the opportunities to find a job in a big corporation were very low. He and his fellow students were struggling to find jobs and thus many of them were pushed to make use of their own business ideas. Msafiri was born in a small town close to Moshi. His father was a tailor, which affected Msafiri’s early understanding of clothing and dressing. Throughout his childhood he learned to distinguish good and bad materials. He developed his own understanding of how clothes should fit to their wearer. However, when he started his Bachelor in Dar es Salaam he recognized different international influences on the Tanzanian clothes market. Second-hand clothes from Europe were sold on Dar es Salaam markets and shaped the fashion in the city. This gave Msafiri the feeling of losing a part of Tanzanian culture. He thus developed the idea to produce customized fashion using European cuts and traditional Tanzanian fabrics. Shortly before Msafiri graduated, he decided to make use of his idea. As his father had some contacts in Dar es Salaam, it was quite easy for Msafiri to start. First, he had one tailor who was tailoring the clothes for him. Msafiri was doing the marketing, getting customers and discussing the different cuts and fabrics with them. After he graduated he tried to scale up his plans. Second, he was looking for a shop close to a crowded market region in Mwenge. After his customer base was big enough and his tailor was overstrained by the different orders, Msafiri decided to employ two other tailors. 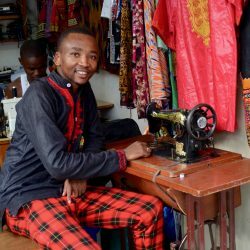 As his shop was located very close to the market, Msafiri was able to look for different fabrics with his customers without needing his own big fabric stock. In his first business year Msafiri produced dresses, suits, bags and all kinds of clothes. He combined “western” trends and traditional Tanzanian fabrics which gave his designs a very special touch. Today Msafiri empoys six tailors in his small shop in Mwenge. By producing about 100 different customized clothes per month, Msafiri’s shop has a monthly turnover of about 3.5 million TZS. His own monthly salary is about 500.000 TZS which equates to an average monthly salary of a big corporation. In early 2017 Msafiri started to produce his first non-customized products for foreign markets. Due to international contacts he made at university, he received the possibility to send clothes abroad and immerge in new markets. 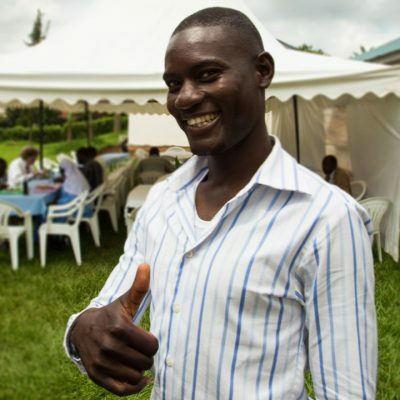 The STEP training gave Msafiri the opportunity and skills to make use of his business idea. Today, he can be seen as a very successful entrepreneur, knowing his market and designing a sustaining business strategy. In our call he mentioned that he will have some problems in further scaling his business in the future, as tailored fashion is very individual and requires a lot of customer service. However, he also stated that through the knowledge he gained by attending the STEP training, he will be able to enhance his business model and strategy. Janet was typical of many students in Uganda. Before the training, she had not been involved in any entrepreneurial ventures, and she had not attended any prior entrepreneurship courses. Janet knew that the job market conditions were poor for her even with a university degree, but she did not consider becoming an entrepreneur as an attractive and feasible career option for her. She was afraid of the challenges entrepreneurs face. According to her report, starting and running a business in the training was a “totally new experience”. The experience that it is possible to overcome the challenges of entrepreneurship and to successfully operate a business “opened her eyes”, as she said. Janet elaborated that the training was a turning point in her life, which changed her belief that entrepreneurship is an insurmountable series of tasks. She also explained that she learned to reflect after failures, learned from errors, and that she learned to start anew despite of unfavorable circumstances. She developed a “never-give-up” attitude and learned to use errors and failures as a valuable source of feedback. 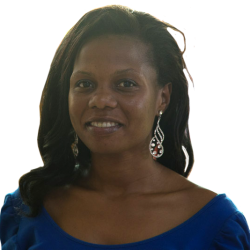 After the training, Janet started a poultry farm and managed to supply retail shops and hotels in Uganda’s capital city Kampala with eggs and chickens. One year after the training, she employed five full-time employees. The poultry farm was located in a village some hours away from Kampala, where she lived with her husband. Commuting between the village and Kampala was demanding. She decided to sell the farm and start an event management business, which she successfully set up 18 months after the training. Janet closed the event management business 24 months after the training and, instead, launched an information technology consultancy that developed computer software, designed webpages for companies and private persons, and installed networks for offices and homes. Janet had started the information technology consultancy because of her university education in computer science. It is interesting to observe that she had started with a business of low complexity, and over the years, she created a business in her field of study. When we met Jane again around four years after the training, she informed us that she still owned the information technology consultancy. Furthermore, she had started an additional business – one of the few ice cream parlors that you can find in the city center of Kampala. Through STEP, Janet has formed and pursued different entrepreneurial goals; she has changed from a non-entrepreneurial student to a successful portfolio entrepreneur starting and managing several businesses at the same time. STEP did not only teach the five friends the necessary skills and knowledge to successfully run a business, but also offered room to practically develop their business ideas and promoted their self-confidence. The group members Robin Murimi, Hellen Kariuki, Stephen Ngugi, Terry Nissi Wambui and Ibrahim Faruq were already friends before the STEP training started. After receiving the starting capital, it took them a while to come up with a promising business idea. The group interviewed their parents, friends and colleagues for inspiration and decided to sell flavoured popcorn to fill a market gap in the area. In the next step they started Google research for recipes and asked students of Mount Kenya University for their favourite flavour before they started experimenting. Besides chocolate, which was the most popular one, they also produced caramel, strawberry, ginger, mint, lemon, honey, etc. flavoured popcorn. Throughout the training their variety of popcorn expanded due to customers’ requests. Once a customer asked for plantain flavoured popcorn which the group is yet to produce. At the beginning of the training the group would meet almost every evening at friends’ rental houses to make the popcorn. Each group member had their own task in the company such as CEO, secretary and packaging manager, but the popcorn was produced, flavoured and packed by all of them together. The group sold the packed popcorn on the streets and in the university but mainly they knocked at doors, talking to customers directly. Robin said: “interacting with people was the most fun part.” In the sales process they saved the customers mobile numbers and started to produce by order. They developed a huge customer network. For special occasions the group developed special popcorn. For example, on valentine’s day they made chocolate flavoured red coloured popcorn with “happy valentine” stickers and made a profit of 5000 KSH (ca. 40 Euro). The group bought 1 KG of corn in the supermarkets for 200 KSH (ca. 1,60 Euro) which they sold in one day for 2220 KSH (ca. 18 Euro). At the end of the training they made a profit of 26.000 KSH (ca. 209 Euro). The profit was used to pay each group member a salary, to buy further stocks of corn and the rest was saved for the business. After the STEP training was finished, the group decided to keep the Popcorn Parlour running. One of their future plans is to sell popcorn at cinemas. There are two cinemas in Thika and they have already contacted one of the owners to discuss the selling. Furthermore, they want to register the business and open their own shop called “popcorn inn” one day. “Popcorn inn” shall be a chain of shops across the country in the future. The students are very thankful for the opportunity of joining the STEP training. They learned a lot, especially concerning the business plan and registration. In the classes the students felt the lecturers were dealing with every single one of them which they really appreciated. The classes were interactive and therefore they were able to practically develop their ideas. The group members gained a lot of self-confidence throughout the STEP training and their entrepreneurial experiences to continue with their popcorn business. In the long run, the students believe they are capable of successfully starting another business on their own, maybe even in their field of studies. The STEP training supported the students to go their own way and become entrepreneurs. Pascal Mshanga has 3 advises for new business owners: First, be passionate about what you do. Second, know the industry you are going to enter. And third, make your business unique. Pascal Mshanga is 25 years old and currently studies Bachelor of Law at the University of Dar Es Salaam (Tanzania). In 2015 he participated in the STEP training, by now he owns a restaurant. 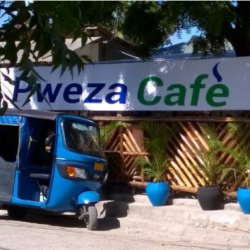 His restaurant is named Pweza Café; pweza is the Swahili word for octopus. The name derives from the kind of food he is offering: he sells seafood like local fish and the eponymous octopus which he gets from the fish market in town. The idea was born one day when he walked around with his friends after work, looking for seafood. Suddenly he realized that in this area there was no restaurant offering such food, hence he decided to open up a seafood restaurant. Before he actually started the business, he shared the idea with some of his friends. He asked the ones who are business owners themselves, to get professional feedback and different points of view on the subject. Since his friends supported him in his intention, he decided to take the risk. He started with doing market research, looked for a suitable location and made detailed plans. When starting his business, several challenges emerged. There were bureaucratic aspects like getting the demanded licenses and financial issues such as getting starting capital and coming up with money for renovation expenses as well as the rent fee. But due to his determination and the support by friends and colleagues from the university he did not give up and finally opened his very own seafood restaurant in December 2015. His customers enjoy well prepared seafood in a classy atmosphere, entertained by radio or TV. If they are not able to stay they can even order take away food or make use of the delivery service. By 2015, Pascal made about 154$ sales per month, payed himself a salary of 68$ and had one full-time employee. 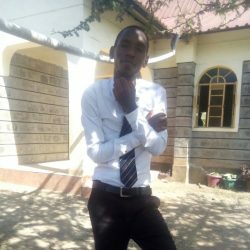 One of the challenges he is still facing is the time management aspect as he is still studying at university besides being a business owner. That is why he has to split his time carefully to ensure that his studies as well as the restaurant get the needed amount of attention. The STEP training helped him a lot in solving this problem as well as many other problems. For instance, the STEP training made him understand the key business aspects such as marketing, accounting and book keeping. Furthermore, he was taught how to conduct a market research prior to the establishment of a business. But the most important thing he learned is to take a risk. And that is exactly what he did. Successfully. Therefore, his future plan is to expand his business to other parts of the country to reach a wider population. If he could give three advices to someone who wants to start a new business his advices would be the following: First, you have to be passionate. Don’t start a business just because of the profit but love what you do. Second, you have to understand the industry you want to work in. Knowing the industry and the dynamics involved is vital. Third, you have to think of something which makes your business unique. You should carefully analyze the market, particularly your potential competitors. Only then you can develop new marketing styles to top everyone else. The students are very thankful for this once-in-a-lifetime opportunity of joining the STEP training. It made them understand that running a business is not only a constant challenge between continuing and giving up but also a special and desired opportunity to grow. During the STEP program at Strathmore University in 2018, Alex Mbogo, Charles Muathe, Daisy Mwende, Edwin Magalasia, and Nick Gahire came up with the idea of starting a travel agency. In the very beginning, every team member tried to pitch their own business ideas, but then they began to evaluate every members’ interests and needs. Among all business ideas, they decided on starting a travel agency named YANA Trekkers. This decision was mainly driven by the vision to create a sustainable business. The name YANA means “You Are Never Alone” and derives from the values and principles their business shares: “We are team-driven by our passion towards nature. Our focus is to offer travel packages that are fun and memorable.” Besides affordable travel packages they offer team building, travel logistics, and well captured moments. The early-stage startup faced several setbacks and difficult challenges. According to their report, the most significant challenge was to establish a trustworthy brand. As they had to cancel their first trip due to a lack of customers, they identified that marketing was a crucial factor to promote trust. Hence, they developed several strategies in order to change the brand perception. By now, they undertake professional and targeted marketing activities on Facebook and Instagram (look for YANA trekkers!). 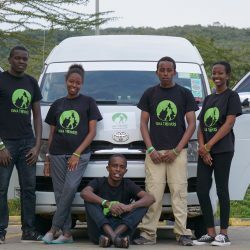 In the long run, their main target is to register their business, to professionalize their service, and to win a title of Kenya’s best touring company. 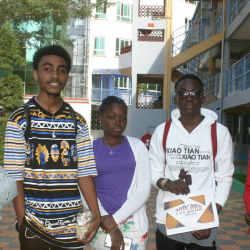 Their future vision is to show Kenyans that Africa with its beautiful culture is a continent worth visiting. With an eye to fulfilling the vision of changing Kenya’s travel industry, they plan to use and develop new technologies. Dennis Ngeno early realized that he has a burning desire to be his own boss and to decide independently what to do with his time and how to organize himself. The STEP program brought him one step closer to his goal: to be self-employed, running a very successful business. Today, he owns a company that (among other services) takes care of the water provision at larger events. He identified this business opportunity during the STEP program by analyzing his own resources, the market conditions and potential customers. With this business, he did not only employ himself, but he also created jobs for three permanent employees. Depending on the season and the workload, he sometimes even employs up to six persons. Right now, he is still in school and runs his business from there. Once he is done with books, he plans to fully concentrate on his business. Furthermore, due to the previous success of his business, Dennis even aims to further expand the business in the near future. He states, that the STEP program taught him (among others) the skill of risk evaluation, which he did not possess before. He learnt that entrepreneurship is about more than administration of capital, but also includes the consideration of different market factors, in-depth analyses of costumers and the specific target group, and the relationship of supply and demand. He also learnt how to address challenges and that it is mostly best to face them systematically. For an entrepreneur, it is essential to detect potential risks early enough to initiate counter-measures before a risk becomes life-threatening for the business. Dennis explains that the STEP program helped him a great deal in preparing for challenges, finding a way out of risky situations and planning far ahead, for example by writing a business plan. Lastly, he has an advice for youths, who find themselves in a similar situation to his. He recommends not to be scared of new ventures. Starting with a small manageable risk can still lead to success. From there on, business risk as well as success can easily grow.